There’s no such thing as a free lunch, so it comes as no surprise that companies want a little something in return when they reward customers for staying loyal. Thus, the tradeoff at the center of Verizon Wireless’ new Verizon Smart Rewards system: Customers opt in to the company’s location-tracking/marketing program, Verizon Selects, and then earn points toward discounts on “brand-name” merchandise and deals at local restaurants, stores and offers on travel. 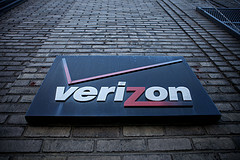 That “may” might be that you’d have to enroll if you haven’t already — it seems it would be a likely requirement, as it enables Verizon to offer deals it thinks will interest customers based on their “location, web browsing and mobile application usage data, as well as other information including customer demographic and interest data,” as explained on its info page about Verizon Selects. Along with getting coupons and discounts, there will be some Verizon-specific deals — like a daily “auction” of LTE tablets through August as well as tickets to NFL games. Customer points can be used to bid in those auctions. Customers will start off with 10,000 points for enrolling, and can earn more by signing into the Verizon customer service portal to pay bills online and using the Verizon Trade In program, among other things. Basically — you give Verizon your loyalty, your money, and your information about what you’re doing on your phone and where you’re going, and it gives you chances to spend more money with what we’re going to assume are its partners. Everyone loves a discount, I guess? Previous Facebook Creates Save Feature, Because You Really Do Want To Read That Article Later – Right?